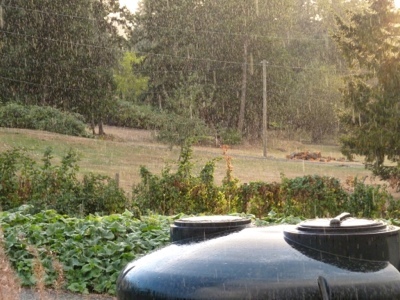 My Home and Garden: My time on a working farm. Learning, weeding and making two new friends. My time on a working farm. Learning, weeding and making two new friends. 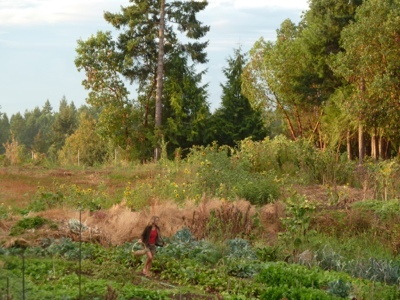 Nicole, picking kale for our dinner. See the huge sunflowers with the multiple heads of flowers in the background? I brought back some seeds. They are gorgeous. I've had the most incredible week. I've had my hands in the most beautiful soil ever. I now know what healthy earth feels and smells like. I have been welcomed by people who didn't know me, and I learned so much from them. They were generous with their time, knowledge and food. They shared their vast knowledge with me. They also shared a HUGE box of potatoes. They are beautiful!! Dirty feet...weird that just my toes and bottoms of my feet turned black. 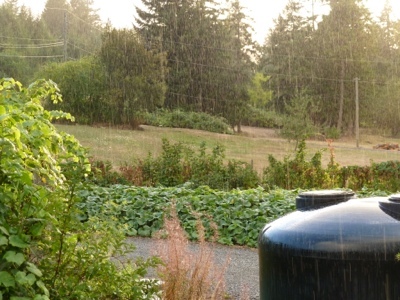 The thousand gallon water tank and the pouring rain. The air smelled amazing. -Farming is fricking hard work. Everything I have hurts today. It's AWESOME. I feel like I've done something. -Farming happens rain or shine. Duh!! Of course it does, but do you picture your farmer pulling weeds and harvesting in the pouring rain? I do now. -You can learn a lot about gardening from books and the web....but being shown makes it very tangible and easier to absorb. We need to teach and help each other get back in touch with the earth. -Finally. And yes I'm yelling...WE DO NOT PAY FARMERS ENOUGH FOR THEIR WORK!!!! I do NOT understand the low cost of fresh, wholesome vegetables. The manure, water, mulch, work, weeding and the space a well grown cabbage takes for example. I really 'get' how stores like Walmart are killing our farmers. We need to pay fair value for our food. Dirk and Nicole. I thank you from the bottom of my heart. Sounds like an eye-opening experience! I worked for a whle on a Market Garden when I was a student, and I endorse what you say about the hard (and dirty) work. Great post. So very true..all of it. You have got to love farming to do it. Sounds as if you had a remarkable time. I watched farmers for most of my young life. I thought I knew what hard work it is. HA! !